Tower Street Ward With its Division into the Parishes, Taken from the last Survey with Corrections. 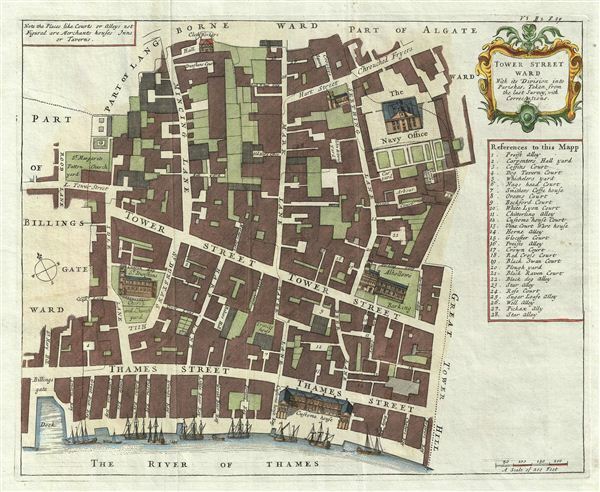 A fine c. 1720 map of the Tower Street Ward, London, england by Richard Blome and John Strype. The map covers the region between and St. Mary's Hill and the Tower of London and from the Clothworkers Hall (still present) to the Thames River, including the gardens and Church of St. Dunstan. Blome identifies numerous important buildings, many of which still exist, including the Customs House, The Clothworker's Hall, and St. Dunstan. A director featuring 28 locations appears in the upper right quadrant just below the decorative title cartouche. The Customs House, the Navy Office, St. Dunstan, and All Hallows-by-the-Tower are rendered pictorially – as are ten merchant ships plying the Thames. Blome prepared this map in the late 17th century, but it was not published until it was included in John Stow's 1720 Survey of London. John Stow (c. 1525 – April 6, 1605) was an Elizabethan historian and antiquarian. He was born the son of a poor tallow-chander in the parish of St. Michael, Cornhill, London. As a young man he apprenticed as a tailor and in 1547 was admitted into the Merchant Taylor's Company. He established himself in Aldgate and later moved to the Lime Street Ward, where he lived to his death. Exhibiting a penchant for scholarship, Stow developed a strong interested in antiquarian studies and became friends with most of the great British historians of his day, including William Camden. His extensive research library, the work of many years in compiling, brought him under suspicion of the church, who considered many of the works "in defense of papistry". While there were numerous attempts to persecute him, Stow managed to avoid any serious repercussions for his book collection and in fact published several important histories. In cartographic circles, Stow is best known for his Survey of London, which was first published in 1598 and subsequently updated and reissued in 1603. The Survey was not just an atlas of London, for it also included amusing anecdotes, highly detailed descriptions of buildings, and comments on social conditions in Elizabethan London. The work proved popular and went through two editions in Stow's lifetime. Following his death, however, London was transformed by enormous growth and the devastating of the Great Fire of 1666. Stow's survey was subsequently redrawn and reissued by John Strype in 1720. John Strype (November 1, 1634 – December 11, 1737) was a Huguenot clergyman, cartographer, biographer, and historian active in London during the late 17th and early 18th century. Like many Huguenots, Strype's family fled to England to escape religious prosecution in Brabant. They established themselves as textile merchants in Petticoat Lane – their street eventually became known as Strype Street. John was educated at St. Pauls School and later at Cambridge's Jesus College and St. Catherine's College. He lived most of his life in Leyton, north London, where he worked as a curate and lecturer of Leyton. He published numerous historical works relating to the Protestant Reformation. His most significant cartographic contribution his is c. 1720 republication of John Stow's Survey of the Cities of London and Westminster. Strype, J., Survey of England (London) 1720. Very good. Original fold lines visible. Original platemark visible. Blank on verso.